It is about 3 blocks from the hotel, around the corner from 131 Clarendon Street (the Hard Rock Cafe). 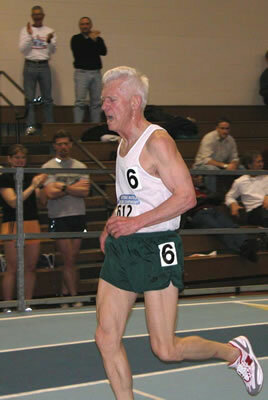 Contact on-site is USATF-New England's Masters Track & Field Chairman Phil Byrne (pmb02129@aol.com). Last updated 04/03/03 -- Complete results posted, including pentathlon. Hotel to Track and Sunday Airport Shuttle info on Housing page. 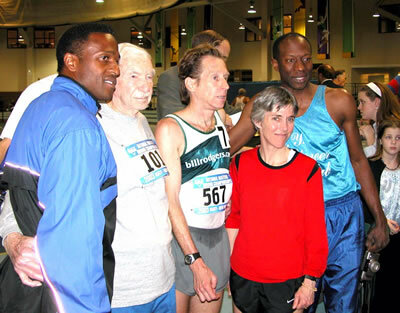 Notatble athletes at the 2003 National Masters Indoor Championships included (from left to right) Willie Gault, Everett Hosack, Bill Rogers, Joan Samuelson and Bruce McBarnete. Photo by Jeff Lerr. ANYONE COMING FROM THE AIRPORT, VIA HARBOR TUNNELS, OR I-93 SHOULD LEAVE THEMSELVES PLENTY OF EXTRA TIME ON MEET WEEKEND. The Big Dig artery/tunnel project has major re-routing and constriction (and construction) scheduled beginning Friday March 28 and running through Sunday March 30. This WILL make downtown Boston in the area of Boston Harbor and the end of the Mass. Turnpike more of a "challenge" than usual. Preparations are well underway for the sixth consecutive USATF National Masters Indoor Championships to be held in Boston, Mass. The meet will open on Friday March 28th at 9:30am with the men's and women's pentathlon and conclude on Sunday afternoon the 30th with the sections of the 4 x 400m relay. The Reggie Lewis Track and Athletic Center, which has produced well over 100 masters world indoor records in the past five years, is expected to see a continuation of alterations of the record book in 2003 as 800 competitors are expected for the event. The meet will be hosted and managed by the New England Association of USATF, reprising their role in the 1998, 2000, and 2002 Indoor Nationals. The 2003 meet presents the ninth time that the Championships are held in New England, the first time being in 1975 (Tufts University, Medford MA) with approximately 100 participants. In 1981, about 200 competitors met at M.I.T. in Cambridge MA. In 1998, the third year of competition in Boston and organized by the New England Association of USA Track & Field, the meet had a record 817 entrants. Meet management in 1997, 1999, and 2001 was by TRACS, Inc. Meet management through 2004 will be by USA Track & Field - New England. Meet sponsors and supporters for 2003 include the B.A.A., BIOFreeze, Dunkin' Donuts, M-F Athletic, New Balance, Shooting Star Media / Larry Eder, the Westin-Copley, and the Friends of the Indoor Championships. And we couldn't do it without the officials on the floor. Click here to view the list of competitors as of Wednesday, March 26, 2003.